The research on the amount of salicylate in different foods shows different amounts even in the same food. Why are they the most emphasized suspect natural food chemical? Why can’t salicylate amounts in food be neat like tables of lactose in food? Doctor Feingold, the early researcher who made the connection between salicylates, and additive flavours and colours, tells the story of a patient who had a bad reaction to flea bites. A pharmacologist connected the low molecular weight compound the flea was injecting into people, to another low molecular compound: aspirin. Feingold developed a diet from one used by dermatologists, excluding aspirin and foods containing natural salicylates which have a very similar chemical structure to aspirin. He later noted that synthetic flavour compounds also have a salicylate-like component and excluded them as well. Over time he also noted that yellow dye was causing adverse reactions in his patients. He redesigned the diet to incorporated this, and all artificial colours and flavours became important exclusions. His work became controversial as he emphasized the possible adverse effects of additives at a time when the public was concerned about non-natural foods, and the food industry was very sensitive. You can read the interesting story of the diet development in my thesis: http://foodintolerancepro.com/product/thesis/ The first chapter covers the connection of diet to behavior, and in the last chapter discusses what were the important groups of food exclusions in food sensitive families, so forming the diet best suited to those investigating possible food sensitivity. Findings from influential work by Swain in 1985 and Egger in 1985 are incorporated. The easy-to-read story is also told in Chapter 1 of Are You Food Sensitive? This gives you the position up until 1998 after Venmer’s research was published in 1996. His team verified salicylates present in herbs and spices. So salicylates in food were proved to have a role though not a neat one. I particularly remember a critical paediatrician commenting that salicylate sensitivity was “as rare as hen’s teeth” in the general population, yet hearing it reported as not uncommon in diet-responding families. We can think about what has happened in two ways. Over time researchers hoped that by concentrating on researching particular compounds, they will be able to clarify which foods are important to exclude and make a neat diet that will work in everyone. The other way of thinking in this uncertain area is to do clinical research: that was to follow up food sensitive families and report on just what they and their children reacted to. I found individual variation in what individuals reacted to. So did other clinical researchers. From that research I could developed a diet that was a good diet to begin investigation. Then each family test and find what their individual tolerances were. 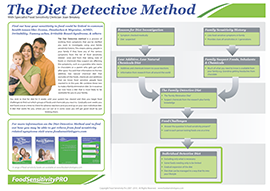 You can read the detail of what I called “the detective process” in Are You Food Sensitive? In 2014 when I revised the book I included a section on salicylates in Chapter 3 summarising the main ideas. My clinical research showed that where people react to additive colour and flavour, 80% of them will also react to salicylates, so any diet that investigated additives should also minimise salicylates.